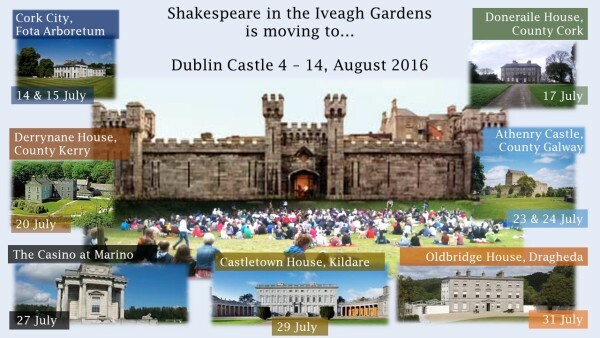 Ireland's Shakespeare in the Park is one of the most popular and beloved theatrical events in Dublin. staged in majestic OPW/Irish Heritage Sites. Read reviews of our previous productions. Our plans for the next 5 years include more touring locations, more performances and up to 3 productions touring Ireland simultaneously - so getting in on the ground floor as a sponsor now has the potential to drive significant returns in the future. It will run throughout 2016, exploring Shakespeare as a living writer who still speaks for all people and nations. This will bring Measure for Measure - Ireland 1916 world wide attention, and Fortune's Fool Productions is proud and honoured to be part of this exceptional programme. Exclusive naming rights for the tour and Dublin Castle. Promotion of products and services at every venue, in playbills, through social media and our website. Event banners at every venue and performance. Early admission and unlimited, reserved VIP seating at every venue. Meet & greet reception with the cast Logo featured on website, social media, posters and on all promo and PR materials. Naming rights for Dublin Castle OR for the tour. Promotion of products and services at Dublin Castle OR at tour venues, in playbills, through social media and our website. Event banners at either Dublin Castle OR on the tour. Early admission and unlimited, reserved VIP seating at selected venues. Meet & greet reception with the cast. Logo featured on website, social media, posters and on all event materials. Naming rights for tour transportation. Event banners at tour locations. Early admission and unlimited, reserved VIP seating at tour locations. Meet & greet reception with the cast on tour Full page ad in the playbill. Logo featured on website, social media, posters and on all tour materials. Named acknowledgement for all images featuring costumes & accessories. Event banners at all performances. Early admission and unlimited, reserved VIP seating at selected venues. Meet & greet reception with the cast. Full page ad in all of the playbills. Logo featured on website, social media, posters and on all event materials. Naming rights for the venue Event banners at tour locations. Early admission and unlimited, reserved VIP seating at tour locations. Meet & greet reception with the cast. Full page inside cover of the venue’s playbills. Logo featured on website, social media, posters and on all venue materials. Meet & Greet with specific cast member(s) with photos. Autographed and personally inscribed script(s). Logo featured in the playbills and on selected social media posts. With 25 actors and crew members and audiences of 1,000 per performance, there are ample opportunities for local pubs and restaurants to become the official pre-show dining and/or post show drinking establishments of the production. One of the benefits of producing Summer Shakespeare in large, outdoor venues, is that audiences can bring pic-nics and dine during the show. Picnicking at Summer Shakespeare is one of the most fun and unique aspects of our event. Picnicking at the venue has become such a tradition that many revelers bring enough to share with newbies who come unprepared. This creates a fantastic opportunity for local restaurants and food vendors, who can sponsor the production and offer picnic supplies or picnic hampers exclusively for the shows. Average audience attendance for each performance is between 800 to 1,000 which can drive a huge return on investment. Picnic suppliers will be promoted to our audiences through all media channels. Corporate Social Responsibility has become essential in today’s competitive market and one of the biggest hurdles is finding the right partner. Fortune’s Fool Productions wants to create long term, sustainable CSR partnerships that can grow with us over the next 3 to 5 years. We will perform for 20,000+ people this summer and our publicity will reach more than 500,000. That’s a lot of reach, a lot of promotion of sponsorship and a lot of potential brand loyalty from our audiences. Many CSR initiatives don’t have this kind of impact. Invite stakeholders to take part in this fantastic event. You’ll get VIP seating at any venue and we will set up meet & greets with the cast after any show. For sponsorships of €10,000 or more, we can also come perform excerpts from the show or we can provide team building and creative workshops for your staff. "Staging [Taming of the Shrew] in Ireland with the referendum for marriage equality a recent memory, Fortune’s Fool Productions succeeds in making us think about love, power, society, the construction of unjust hierarchies, and the strangeness of social ritual, where the absurd and the sublime often collide."